Whether you love her or hate her, it cannot be denied that Sarah Palin is a polarizing figure. Given her background as a beauty queen whose career path carried her into politics, her story should make an inspiring tale for young readers to see depicted in an illustrated biography. And as the first female governor of Alaska and the first woman to hold a position on the Republican Party’s Presidential ticket, Palin’s life certainly seems worthy of analysis from a historical perspective. Sadly, this book tells us surprisingly little about Sarah Palin as a person or a politician. Rather than telling the life story of one of the most interesting figures in recent American political history, this book focuses firmly upon the 2008 Presidential Campaign and the behind-the-scenes management of the Republican Party’s ticket. Nothing is said about Palin’s childhood, her experiences as a beauty pageant contestant, her work as a local television sports reporter, her service as Mayor of Wasilla, Alaska, or even her tenure as Governor of Alaska! Three of the book’s four chapters are devoted toward the 2008 Presidential Campaign, with information on Palin’s life before becoming Governor of Alaska limited to one paragraph describing her start in politics as a PTA member who ran for city council. To put this further in perspective, Palin’s entire post-election career is crammed into four pages. That’s two-thirds the space devoted toward describing the series of secret meetings held over two days in the summer of 2008 in which Palin met with several Republican Party advisors and then Republican Presidential nominee John McCain himself. 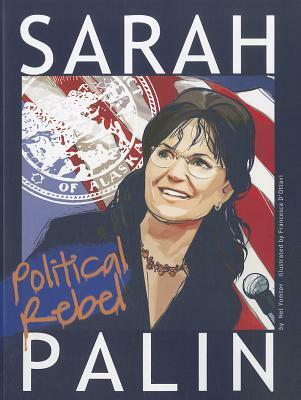 To this book’s credit, it does not shy away from the more controversial moments of Palin’s time in the spotlight. Her frequent misstatements of fact, her disastrous interview with Katie Couric, and other acts of “going rogue” are covered in equal detail to her successes. And as rushed as the final chapter seems, it does note Palin’s resignation from the Governorship of Alaska as charges of corruption, nepotism, and misspending state funds mounted against her. The artwork is both odd and off-putting. I do not know if the images for this graphic novel were traced off of a picture and then colored strangely or if they were repeatedly run through a filter in Photoshop. The fact that I can seriously consider and visualize either of those possibilities being a reality does not speak well of this book’s artwork. Ultimately, this book offers little to recommend itself. The text of the book itself is lackluster and the artwork is mediocre at best. It holds little worth as a source of information since, despite its title, this book is not about Sarah Palin so much as it is a book about the later days of the 2008 American Presidential Campaign. Even then, it fails to cover the campaign in any great detail. Even the last chapter depicting Palin’s life post-election fails to be of any practical use, already being out-of-date despite being the book being published in 2012.